Menulog delivers for Great Aunty Three - Enmore so you'll be able to track your courier on a map. 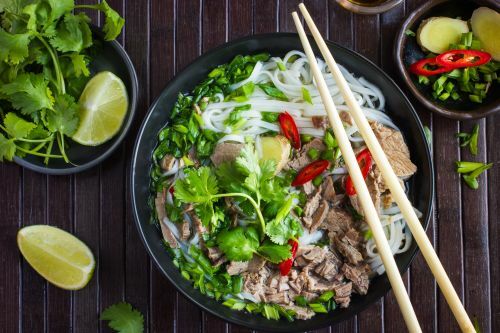 Tender beef fillets, beef brisket, flat rice noodles, shallots, coriander, hoisin sauce and fresh chilli. Grilled chicken breast, flat rice noodles, shallots, coriander, hoisin sauce and fresh chilli. Watercress, green apple, tomato and vegan tofu chicken served with special vegan soy sauce. Braised beef served with traditional Vietnamese fish sauce dressing. Roast pork with pork crackle served with traditional Vietnamese fish sauce dressing. Grilled chicken served with traditional Vietnamese fish sauce dressing. Juicy tiger prawns served with traditional Vietnamese fish sauce dressing. Freshly steamed barramundi fillets served with traditional Vietnamese fish sauce dressing. Roasted duck served with traditional Vietnamese fish sauce dressing. Green apple, tomato and vegan tofu chicken served with vegan soy sauce. 12-hour roast pork with pork crackle. Vegan tofu chicken with side of silken tofu. Braised beef served with rice, egg and side salad. Barramundi fillet served with steamed rice, egg and side salad. Succulent prawns served with steamed rice, egg and side salad. Three delicious rice paper flavours delicately wrapped with lettuce, perilla, mint and rice noodles. Vegan tofu chicken, silken tofu and salad sensation. Three delicious rice paper flavours delicately wrapped with lettuce, perilla, mint and rice noodles. Roast duck, roast pork and chicken. Three delicious rice paper flavours delicately wrapped with lettuce, perilla, mint and rice noodles. Two tiger prawns and barramundi. Three delicious rice paper flavours (vego, meat and seafood) delicately wrapped with lettuce, perilla, mint and rice noodles. Vegan tofu chicken and silken tofu with special vegan soy sauce. Grilled chicken cooked to with special sauce. 12-hour roast pork with pork crackle and granny smith apples. Caramelised pork belly slow cooked in coconut juice with crackle, kimchi and onion rings. Soft fluffy hot buns filled with soybean, vegetables and wheat. Coconut water, lime and coconut cream. Mixed berries, lychee and watermelon.